These blouses are wonderful. I fell in love with the pattern and ordered it immediately. I have a few pieces of rayon and silk with wonderful drape and I thought this would be the perfect pattern for them. As per usual when I make a pattern, I scour Pattern Review so I can see how others have interpreted this pattern. First there was the lovely Bernie Gee who loved the pattern and as you can see, she looks so elegant in it. Here is her review of the pattern. The beautiful Cenncetta of the Mahogany Stylist blog, also created this pattern. I want to thank them both for the help with this pattern when I became confused. After thirty years of sewing, I couldn’t figure out how this went together. The directions are well written with lots of hints and tips from Sandra. In the middle of assembling this pattern, I did get sick. I also was distracted trying to make my pants sloper from Pattern Master Boutique. Finally, I just put it away for a few weeks and went back to it. Something clicked and I was able to finish the wearable muslin. The first blouse is made up in a stable knit with not a lot of stretch. 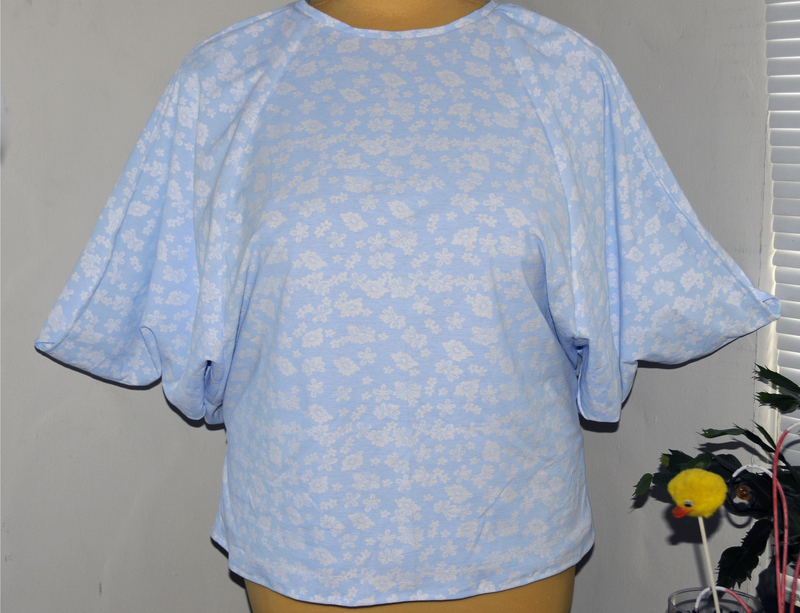 It also has less drape then this blouse needed. It is wearable. 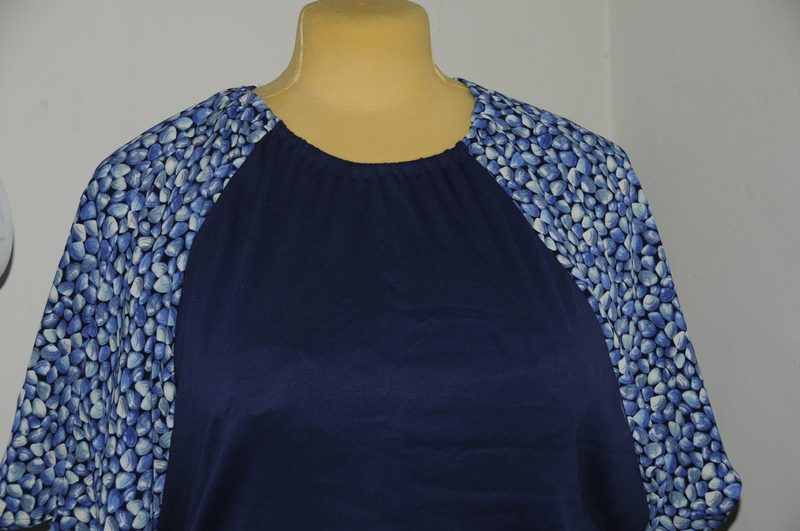 The neckline can be tricky and Sandra gives some tips for making the neckline lay flat. In this instance, I stitched it to the neckline as Sandra instructs then topstitched the seam allowance to the body of the blouse. This seemed to snug up the neckline so the band would lay flat. 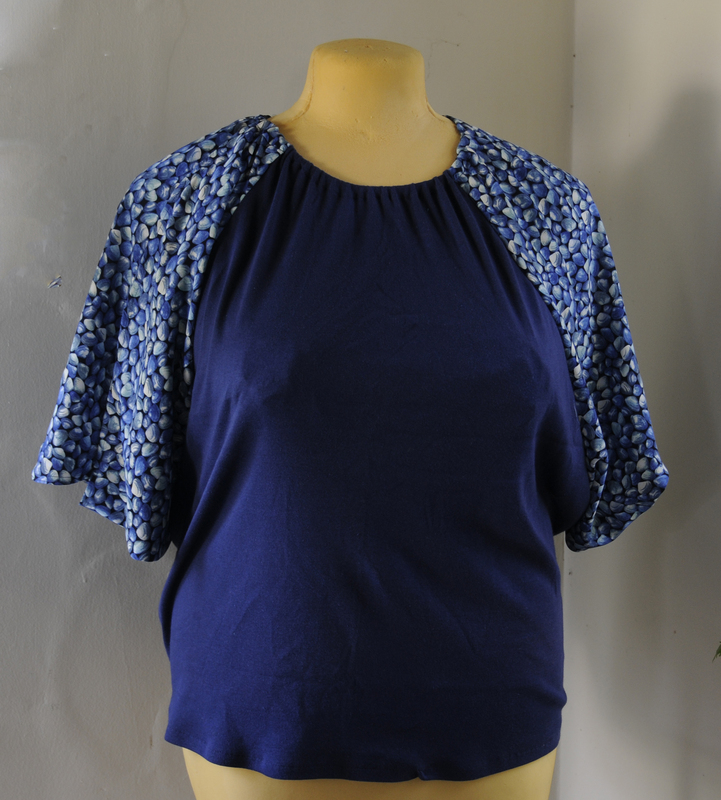 The second blouse, I made out of a rib knit for the body and a very soft drape rayon for the sleeves. This blouse was easy to assemble, but the neckline went bad. I probably should have used the rayon for the neckline instead of the the knit. The neckline stretched out beyond repair. I tried the same treatment of stitching down the seam allowance but that only made it worse. Then I tried to turn the neckband to the inside like a facing and that was a mess also. I was honestly about to throw the whole thing in the garbage when I had an idea. I jacked the differential up in my Evolve and set it to a 2 thread overlock. I then shaved off the neckline with the band. I then folded the neckline to the wrong side about 3/4 inch and threaded 1/2 inch elastic through it. I was able to live with that. One final word….. Be sure to look at the completed measurements that are written on the pattern. In certain fabrics, this pattern could be too tight. In the directions, Sandra even accounts for that saying that if it’s too snug around the belly you can put in a gusset. I would rather cut a larger size in advance. Image | This entry was posted in Babylock, Bernina, Sewing, Sewing Patterns, Sewing Projects, Uncategorized and tagged Blouse, Crafts, knits, Neckline, Pattern, Patterns, rayon, Sandra, Sandra Betzina, Seam allowance, Sewing, Shopping, Supplies, Textile, todays fit. Bookmark the permalink. I left you my phone number in an email. Did you receive it? Fantastic Kuby, They turned out great. I’m glad I was able to help.